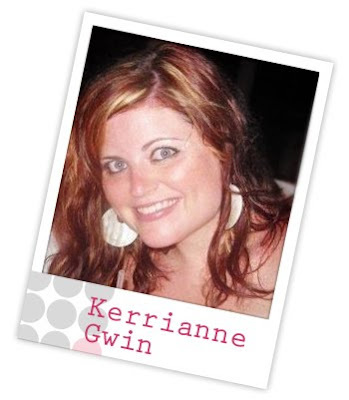 Kerrianne is a new-comer on the scene when it comes to blogging. Now that she has finished her Master's Degree, she will have plenty more time to get creative! Also a professional Graphic Designer, she is crazy talented, with a unique style and an eye for color. She has a love for all things retro and vintage, so I can't wait to see her bring that out in her creations with the Design Team. Be sure to stop by her blog and welcome her to blogland, I have promised her that you ladies are the friendliest bunch and tons of fun! And don't forget to check back tomorrow for the last Design Team announcement! First, I just want to thank you all so much for your support so far! I am completely floored with the number of people that have already subscribed at www.Wplus9.com. Again, trying to narrow down favorites is just torture, but I have picked some samples of her work that really speak to me. Don't forget to check back again tomorrow, we will continue the introductions with another one that you WILL NOT want to miss. I am very excited, humbled, and honored to share the Wplus9 Design Team with you. These are a wonderfully talented group of ladies. Each one has their own style and flair. And each have agreed to help me debut my stamp line! How lucky am I?! 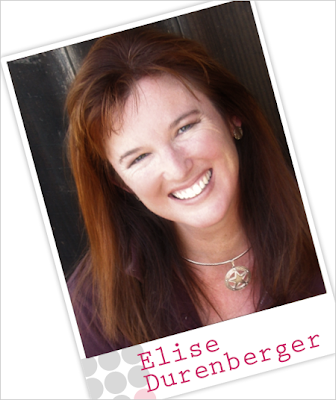 I will be announcing a new designer here on the blog each day until Saturday. 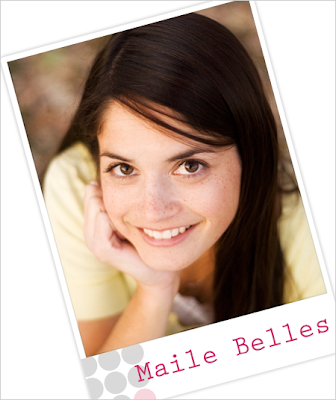 And today it is my pleasure to announce, the one, the only, Maile Belles! 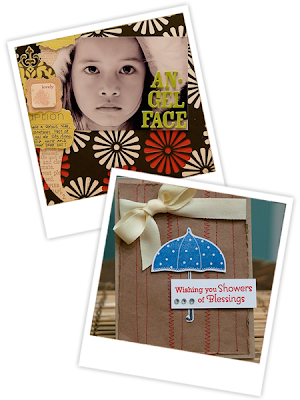 I have long admired Maile's work and often find great inspiration on her blog. Narrowing down her work to just a few favorites is an impossible task. 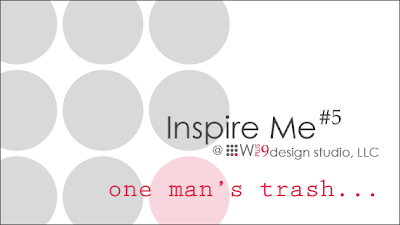 So here are a few samples of pieces that I have personally found inspirational. Some of you may have noticed the small aesthetic changes that have been under way here at the blog. This was all in anticipation of starting my own business. The Wplus9 Design Studio will feature high quality photo-polymer stamps for now, with the hopes of branching out if things go well. I have been into the arts for as long as I can remember in any medium I could get my hands on. 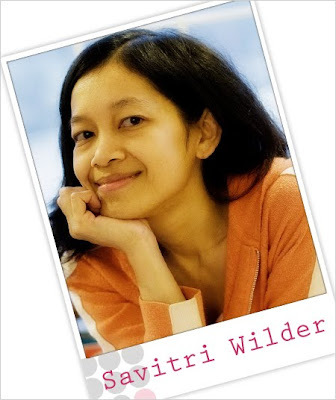 And I have been a graphic artist/designer professionally for the last 11 years. I really love to create. 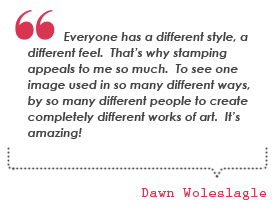 And I really love to see what others create. So this just felt like a natural fit. I know it's a big risk, but it should be fun. And I'd hate to always wonder "what-if?". I am hoping that you will join me on this adventure. 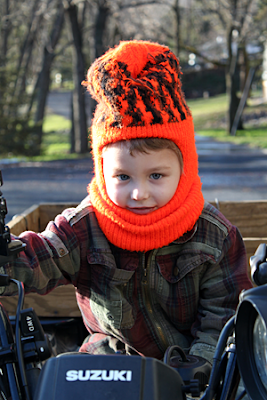 Each day this week I will be announcing a new member of the Wplus9 Design Team! And they are sooo talented, I mean T-A-L-E-N-T-E-D. And I am extremely grateful that they have agreed to help me showcase my new line. The Studio will open in early February. Be sure to stop by www.wplus9.com and sign up to be notified by email as soon as the store is open. 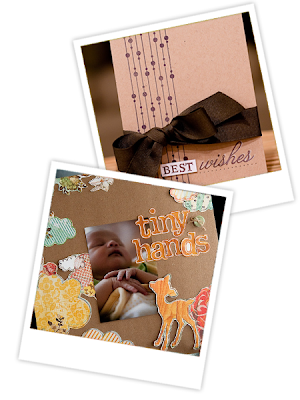 I will also be keeping you updated here on the blog, and will be posting samples from the first release next week! Wow, what a week! I am super tired right now and apologize for the poor picture quality. I just didn't feel like getting out the light tent. I've been working around the clock getting ready for my big announcement. Be sure to check back here often throughout the week as there is going to be some big news and a ton of excitement. 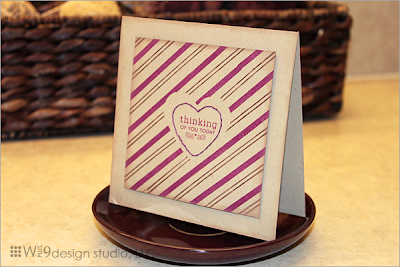 For today's card I participated in Embellish Magazine's Stripes Color Challenge: Purple, Brown, and Kraft. Now it's no secret that I *almost* hate the color purple. But I thought what the heck. So here it is. I did my infamous CAS style. Love those minimalistic designs. I really think it's the details that make a CAS card work. 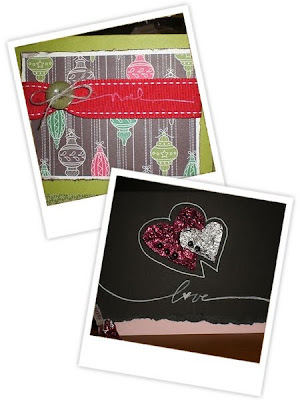 Here, I masked the middle with a heart and stamped right over it with brown and purple ink using PTI's Faux Ribbon set. I stamped my sentiment in the middle of the masked area, and then pre-pierced my holes in a heart shape just insided the masked area. This made it super easy to come in and do some back-stitching. Hope you enjoy and have a wonderful night! ..is another man's treasure. So the saying goes. 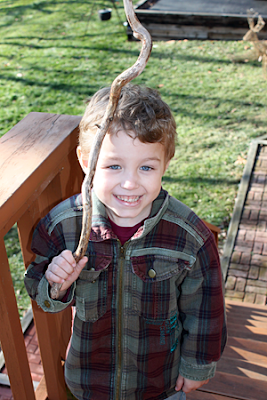 So let's see what you can find to repurpose, and make some of those treasures! 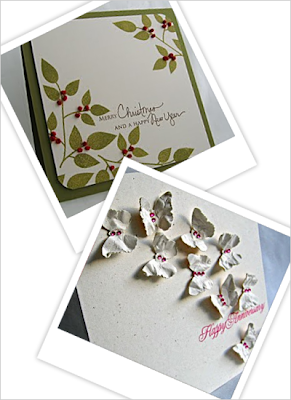 Create a card, scrapbook page, gift item, or anything you desire. Use whatever colors you like, whatever occasion, just make sure you have used an item that otherwise would have been tossed. Need some ideas? How about coffee sleeves, shopping bags, left over packaging, clothing labels...even the fabric from an item you were going to throw out. In addition to my picks, I will select one random entry to win the fabulous prize pack below. All items are brand new and still in their original packaging. The links will remain open until 11:59 pm January 30th. Have fun and I hope you find time to play along! I used the random number generator to pick the number. I did have one poster with 2 comments, so to be fair I deleted it which left us with 17 total comments. 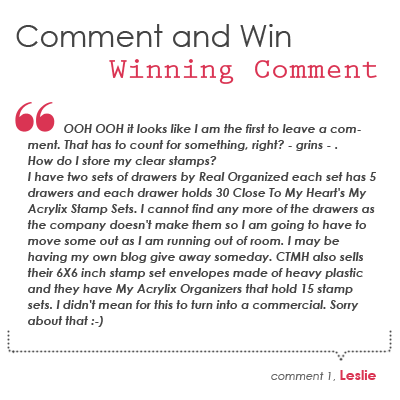 Congratulations Leslie, email me your information and I will send off your stamps! 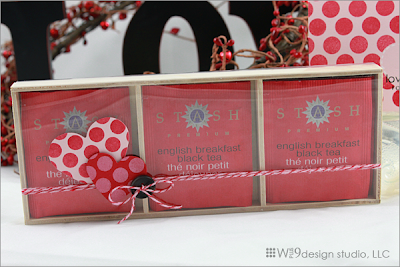 The ladies over at Embellish Magazine have issued a challenge to use red, pink, black, and hearts. I think I am enjoying this color combo a little too much(this is my third submission), but seriously isn't that just the cutest thing ever!? I used the train from the SU! 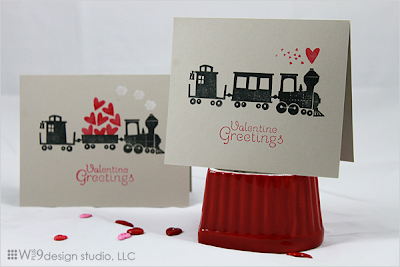 stamp set Choo Choo. It's such a sweet set. All of the cars are separate, 4 in all, and a little puff of smoke. 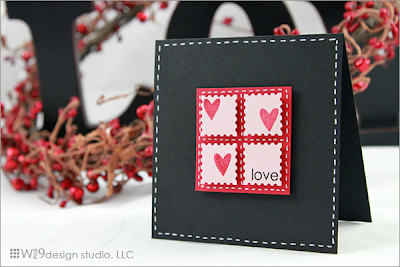 Here I paired it with a little heart from a Hampton Arts stamp set. 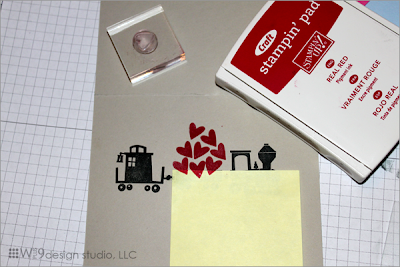 To make the little trail of hearts I used a portion of a stamp from the SU! 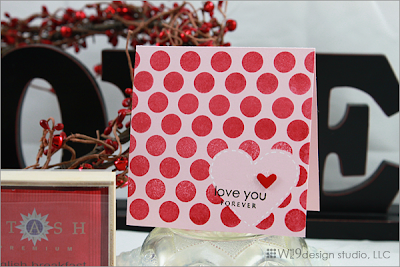 A Happy Heart stamp set. I just inked up the part I wanted and lined it up to look like a trail of hearts coming from the chimney. Would that be a chimney? Oh well, whatever it's called. ;o) Then I just added the buttons for wheels and stamped my sentiment. So simple. I'm not quite sure why I love the one/two layer cards so much, but they are definitely my go to. While I had the stuff out, I decided to make a couple more to send to Winter for her St. Jude Card Drive. I used the same basic layout, but instead of using the pink card base I switched it out with SU! 's Sahara Sand to make it gender neutral. 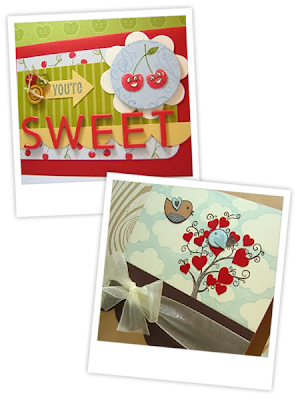 For the card above, I also switched out the middle car and loaded it with a load of hearts. So cute! 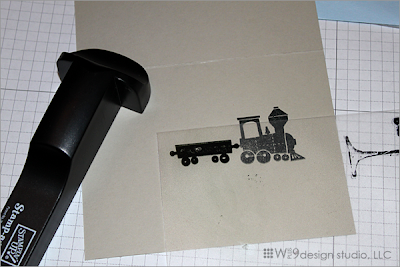 Building the train is super easy as long as you have a stamp-a-majig. I just used the stamp-a-majig to line up each car, and then stamped. Now to fill the middle car I used a little masking. My favorite thing to use for masking is a Post-It note. They are self-adhered and super thin so you usually get a near perfect line. 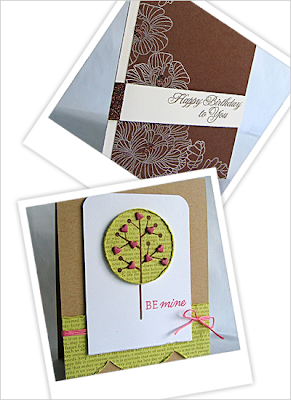 And I'll leave you with a shot of the two finished cards together. I can't believe that I've had this set since last spring and this was the first time that I've inked it up. Tsk Tsk! Thanks for stopping by and have a fabulous night! I will be back tomorrow with a winner from my Comment and Win post below. In preparation for my newest adventure, I have begun to clear out some of my stash. 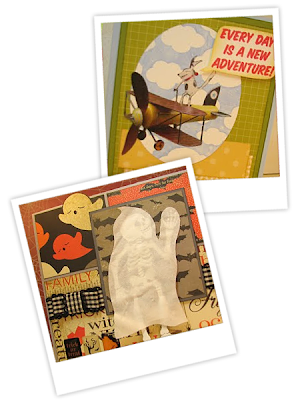 Some of which I will be giving away here on the blog. So here it is, my first official give-away. 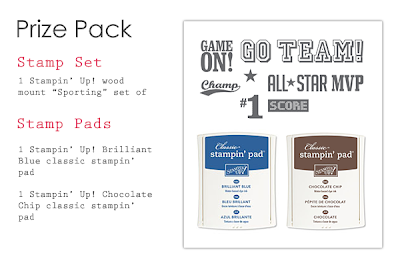 All you have to do is leave a comment for a chance to win a free Stampin' Up! stamp set. 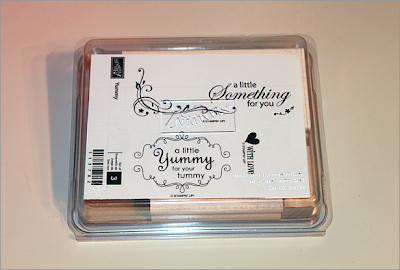 This is the Yummy set from Sale-a-bration last year and was only available as a bonus once purchasing a certain amount. So it was/is not available in the catalog. It's never been opened or used. 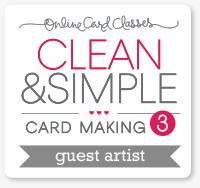 How do you store your clear stamps? Do you have a favorite/preferred packaging? Leave me a comment by Tuesday January 12th 11:59 pm EST and I will pick a random winner. Thanks ladies! Raise your hand if you're glad it's Friday! I know I am. It's been a long week, but in spite of that pestering thing they call work, I've been able to make a ton of progress on my little secret. But it's not time to let that cat out of the bag yet, so on to today's card. 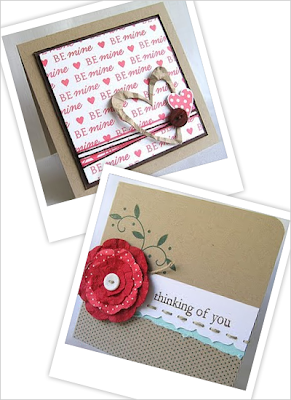 I don't know about you, but I've been on a kick using up my scraps since participating in Nichole Heady's Scraptastic Challenge. Here I used up some left over plaid patterns I created when I was on my plaid kick (which I'm not officially over by the way) ;o). 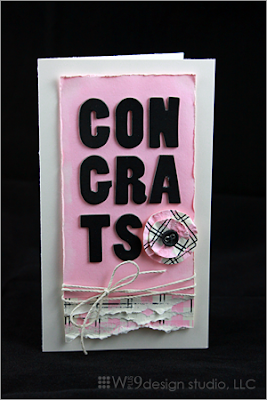 Since this is also a money holder, you can find the template here, I think it would make a great card for a girl graduate. I used a couple of cirlce punches to create the flower, and hand tore some strips from a square of the plaid pattern I created to layer at the bottom. The sticker alphabets are from DCWV. I like the mix of soft and bold, clean and shabby chic on this one. Hope you enjoy! And be sure to stop this weekend if you can. 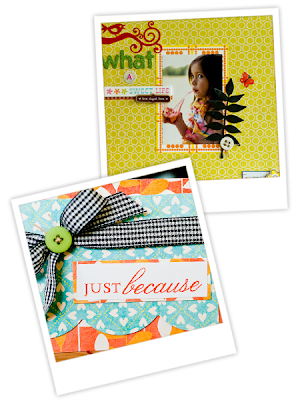 I will be posting a give-away tomorrow, and a new Inspire Me challenge on Sunday. 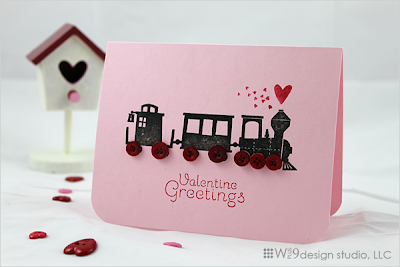 I told you I really enjoyed the color combo challenge over at Embellish Magazine, so I decided to do another card. I also really wanted to send Winter some cards for her Cards for St. Jude project and this one fit the bill for both. I plan to make some more "childish" valentines as well, but just in case I run out of time, at least I'll have this one and I think it would work well for a teenager. Oh, and this was my very first time using my Cricut Expression, and let me just tell you...I AM IN LOVE! Ok, maybe in love is strong, no...it's just right! I am in love with that thing. That beautiful little magical machine. In love I tell ya. Be sure to keep stopping by, I have some very BIG news to share with you guys shortly. And in honor of my big news, I will be doing some give-aways leading up to the announcement. Speaking of big news...did you see that Courtney over at Practicing Creativity will be releasing her very first stamp set tonight?! It's a gorgeous set and definitely worth checking out. Good Luck Courtney! Oh it feels so good to get back to crafting! And there are so many challenges and calls to participate in right now, I'm having a blast. 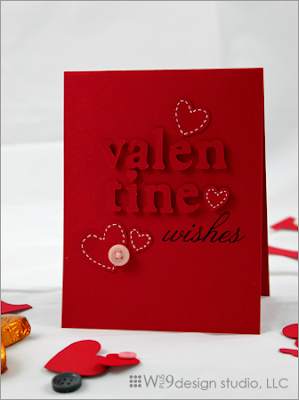 Speaking of, Embellish Magazine is having another color challenge, red, pink and black, with hearts. How fun! I think the abundance of black helps to down-play the pink and red, making this a great masculine card. I really enjoyed this color combo and think I will make a couple more using it. Maybe some to send to Winter Sims for her awesome card drive for St. Judes. If you haven't checked it out...you should. It's for a wonderful cause and Winter is such a sweetheart for organizing it. Hope everyone is having a great weekend! 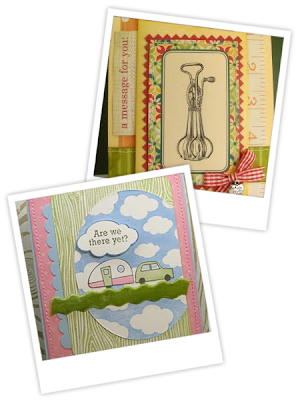 Nichole Heady over at Papertrey Ink has challenged us to use our scraps to create something. I have TONS of scraps and I would love to say that I have them all neatly organized by color or something clever...but alas it's just a chaotic mess. So this was a great challenge for me. I made a little tea gift and a matching card. 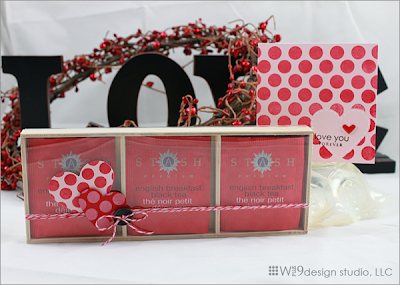 These would make a great V-day gift for friends. I had this neat little wooden tray from some ornament packaging and realized that the compartments were perfectly sized for tea bags. 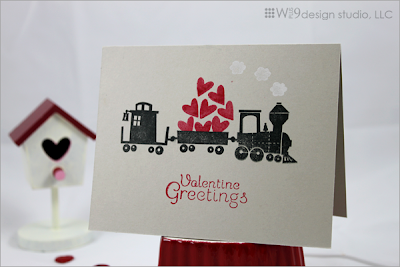 Then used some stamped cardstock from my scraps to punch hearts. Last, I scored some transparency to create a sleeve to slide the tray into. Quick warning...lots of pics and no projects on this post. 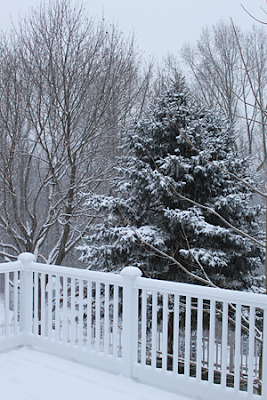 I thought I'd share of couple of Christmas morning pics and a few from our vacation to PA to visit the in-laws (the BEST in-laws ever!) Jason got me a DSLR Canon for Christmas so of course I had to break it in. I'm still getting the hang of it, but am loving it so far. 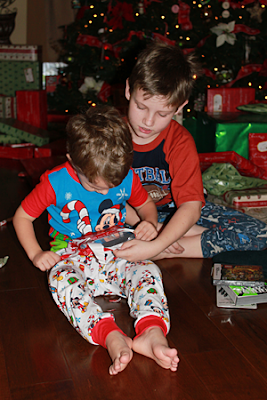 First a couple of the boys on Christmas morning. 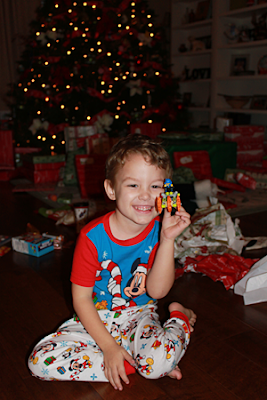 This was such a great Christmas...I just love them at this age. They get along so well and are really close right now. 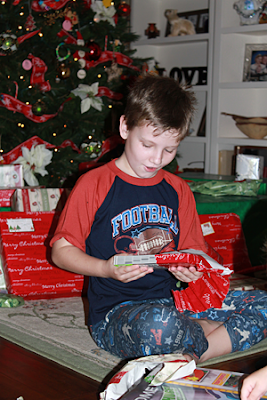 Before I know it, my oldest will be in those dreaded pre-teen and teen years, so I am enjoying it while I can. UGH!! 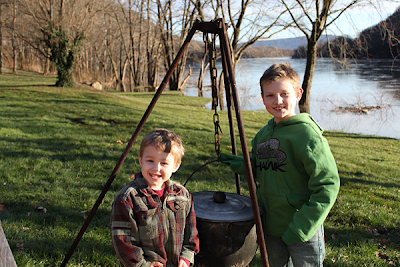 These next few are some of the boys cutting up and enjoying the cold PA air. 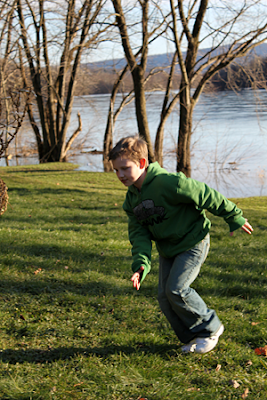 We were right on the river visiting my husband's aunt and uncle. 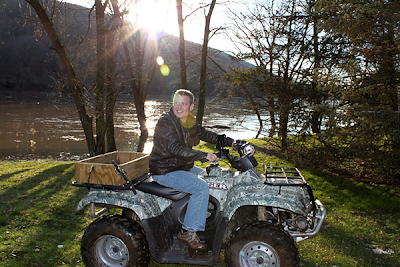 We did a bit of 4 wheeling and played in some of the left over snow (all twelve inches pretty much melted by the time we got there!). 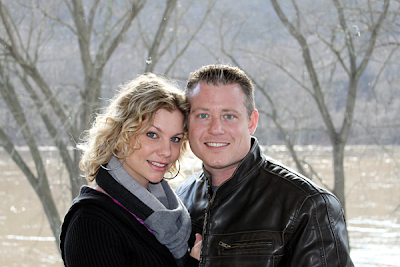 Here's my new favorite pic of me and my gorgeous husband (who was SO GREAT to me this Christmas!) 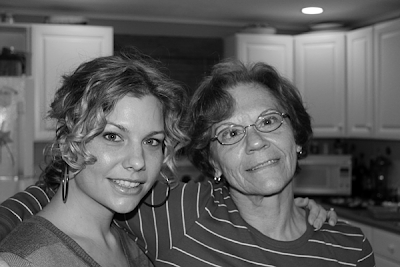 And me and my mother-in-law...I LOVE this woman! 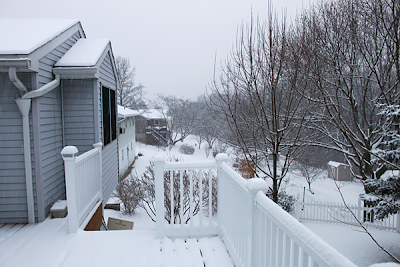 And finally the snow that we woke up to our last morning there. So sad to have to leave it, but Jason did take the boys up to Ski Roundtop to go tubing, so they did get to play in the snow.